Vitamin K antagonists (VKAs) increase risk of minor bleeding in patients with cirrhosis given anticoagulants for portal vein thrombosis (PVT), compared to patients without cirrhosis given VKAs, researchers report in the July issue of Clinical Gastroenterology and Hepatology. However, this risk is offset by the ability of VKA to increase portal hypertension-related, event-free, and transplantation-free survival of patients with PVT recanalization. Portal hypertension (PHT), rather than anticoagulant use, appears to account for the difference in risk of bleeding between patients with PVT vs patients with venous thromboembolism. Risk of bleeding in the comparative cohort analysis. (A) Cumulative incidence function for any hemorrhage. Cirrhosis is associated with increased risks of bleeding and thrombosis. Although PHT is the main determinant of gastrointestinal bleeding, the risk of thrombosis depends on combined effects of reduced blood flow in the portal venous system, endothelial dysfunction, and procoagulant imbalance. Anticoagulant treatment is recommended for patients with cirrhosis and PVT who have been placed on the waitlist for liver transplantation or symptomatic or progressive PVT, and does not appear to increase the risk of gastrointestinal bleeding subsequent to PHT, provided that patients receive adequate prophylaxis of variceal hemorrhage. VKAs promote recanalization of PVT in patients with cirrhosis. However, the benefit of PVT recanalization might be offset by major and minor bleeding associated with use of anticoagulants. Vincenzo La Mura et al performed a retrospective analysis of 63 patients with cirrhosis and PVT (PVT cohort) vs 160 patients without cirrhosis but with venous thromboembolism (VTE cohort) to determine the risk of bleeding associated with VKA treatment. The bleeding risk during anticoagulation in the PVT cohort was adjusted for the bleeding risk due to PHT by comparing the PVT cohort with 139 patients with cirrhosis without PVT who were not exposed to VKAs (controls). 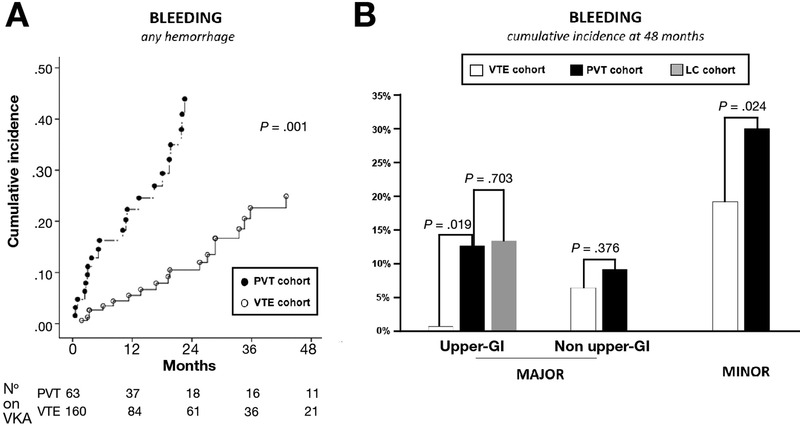 The authors found the incidence of major bleeding to be significantly higher in the PVT cohort (24%) than the VTE cohort (7%), as well as minor bleeding (29% vs 19%) (see figure). The PVT had a higher incidence of major bleeding from the upper-gastrointestinal tract than the VTE cohort, but there were no significant differences in other types of major bleeding. Patients with PVT and controls had the same rate of upper-gastrointestinal bleeding. Complete recanalization in patients with PVT receiving VKA (n = 31) was independently associated with increased portal hypertension-related event-free and transplantation-free survival times. La Mura et al conclude that, as for all patients, the benefits of anticoagulation must be weighed against the risk of bleeding in patients with cirrhosis. In comparing patients receiving VKAs for thromboembolic risk vs patients with cirrhosis and portal vein thrombosis, cirrhosis was a risk factor for major upper gastrointestinal bleeding and minor bleeding. Importantly, the rate of upper-gastrointestinal bleeding in the PVT cohort was comparable with that of patients with cirrhosis without PVT, not exposed to anticoagulation (controls), supporting the conclusion that portal hypertension, rather than anticoagulation, mediates this risk. Furthermore, patients with PVT and complete recanalization after VKA treatment were most likely to survive free of portal hypertension-related events and transplantation. This means that the hemorrhagic risk posed by anticoagulation with VKAs could be counterbalanced by a beneficial effect on the progression of cirrhosis in patients with PVT.